Hei, oikein mukavaa sunnuntaipäivää! 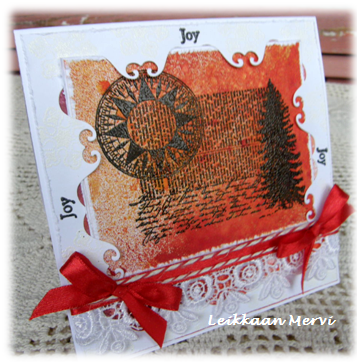 Tervetuloa joulukuun Penny Black and More haasteen pariin. Joulukiireitä helpottaaksemme olemme valinneet aiheeksi " oma valinta" eli kaikki käy, kunhan pääosassa on jotain leimattua. Upeat ja oikeat palkinnot odottavat jälleen, tulkaahan mukaan, koko joulukuu aikaa! Ja onnea viimekuun suomalaisille voittajille Mari ja PiHi, jee! Our theme this December is " It's your choice" as long as there's something stamped on. We have real and fabulous prizes waiting, so come on and join us! Versafine black; clear embossing powder; Dylusions ( postbox red, pure sunshine), gold Glimmer Mist. Satin ribbon, twine, lace; white cardstock, negative of die cut. Distressing and layering. A gorgeous card Mervi and how effective the way you have tucked the main image inside the die cut frame. Apologies I've not been by all week, just not felt up to any blogging or much else come to that. 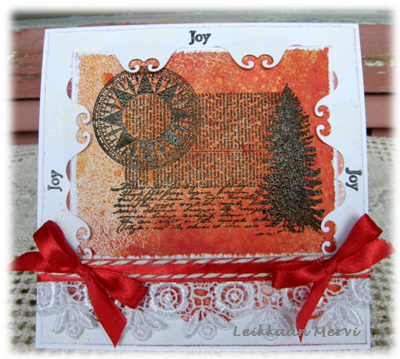 What a great way to use this stamp and I love the touch of lace. Simply beautiful Mervi, the way you framed it looks amazing, and I love those gorgeous color shades! Gorgeous card and I love that lace!! Thanks for joining us at Wags 'n Whiskers! beautiful! the red and white are just so striking and i love the lace. Beautiful framing of your gorgeously inked collage to create a one-of-a-kind design! Thanks for joining Wags 'n Whiskers! This is gorgeous, beautiful colour and I love the image. This is such a beautiful card Mervi. I love your card, beautiful!! Thank you for joining us at Emergency Crafters. Hi Mervi! 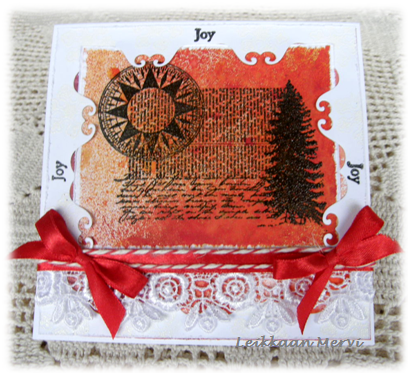 This is such a lovely stamped card! Your pretty red bows really pop out beautifully! Thank you for joining us at Fussy and Fancy for our, "I love Christmas" challenge!